Most people use data from Google AdWords for their keyword research. But what many don't realize is, there are a bunch of other tools out there that can be a valuable source of information as well. The more keyword research you do for your content, the likelier it is to catch up on search results. But more isn't always better. The trick is to do different types of research. For example, you might want to find out what smartphone and tablet users are searching for, because mobile search accounts for almost 15% of all global searches. 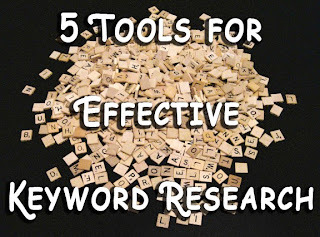 Here are different alternatives to Google AdWords for effective keyword research. I know, Bing gets advertised a lot, but as a search engine, comes nowhere near Google, and all that stuff. But the Bing Keyword Tools is a really amazing one, one I certainly didn't expect from them. You can use it to refine your searches by language, and get results starting from a certain period of time ago, such as the past 30 days, or 6 months etc. You can use these features to monitor the trends and follow up on what's currently hot. Wordpot is again a very good keyword tool with an easy-to-use user interface and an intuitive design. This is one of the better tools when it comes to keyword research, because it packs some perks other keyword tools don't have. It also shows you word definitions, synonyms, related words, and associated words. Hence, it can redefine the depth of keyword research for you, and will help you come up with much more useful and intelligent keyword suggestions than many other such tools. Usability wise, I think this is a great tool. It has probably the most-convenient user-interface, and all you have to do is enter a keyword into the search bar, and you will instantly stumble across some quick suggestions. It will show you volumes for each keyword. If you continue your research, you will find out competition, and a lot more about each keyword. And that's just the limited version. You can get the full version on a free trial for 7 days, during which time you'll most probably live this tool. If you want to do region specific research, this tool is pretty good. It defaults to Google U.K, since it was designed by a U.K team. But you can change the location to U.S or any other location given in the tool. It not only can narrow your research down to regions, but also different languages. It also has the ability to order the cloud visualization it returns by search volume or by AdWords competition. The cloud, ordered by AdWords competition will help you quickly see which alternative keywords, or translations of a keyword you should use. YouTube has a keyword tool as well that will help you generate keyword ideas for videos and other such content. As we discussed at the start, keyword research isn't about finding more and more keywords. It is about doing different types of research, which this tool will help you do. Aside from generating the usual keyword suggestions, this tool also allows you to add a video's URL, and it will then tell you the keywords related to that video, so you can glean keyword information from your competitors' videos. Cool, huh? Wordtracker is a good alternative to Google Adwords Keyword Tools. The paid version is much more powerful than the free version. Nevertheless, if we use both of them, we could have many good and low competition keyword. Still don't know how will help this Google Keyword??? This helps me to find the popular keywords to get organic traffic. thats great man am looking out some post like this ... i like this with this we can improve our traffic thanks ..
Have you ever seen a female Bruce Lee? You're exactly right. One way of getting to know what keyword is highly targeted in the market is through the above tools. I am thankful that I have meet this article. Very helpful! I like Wordtracker. because it's the best alternative of google keyword toos for me. Believe me, Webfire is the best bang for your buck. Been using this for 6 months now and I don't use anything else.